Take a feature packed trip to the land of the ancients in Rome: Rise of an Empire. This virtual journey back in time comes from Blueprint Gaming and is played using a 5 reel, 20 payline game engine. In the base game you could benefit from 1 of 5 modifiers that can strike at random. Also on offer are 5 feature rounds that awards free spins, pick me prizes and much else besides. Don your virtual toga from between 20p and £500 per spin. The setting here is a Roman amphitheatre filled with spectators baying for blood. On the reels you’ll see lower value playing card suit symbols as well as swords, shields, helmets, an empress and a gladiator. The Rise of an Empire logo is the most rewarding symbol, offering payouts of 25 times your stake if you land a 5-in-a-row winner. The SPQR eagle is the wild. This substitutes for all other symbols bar the scatter as well as delivering awards of up to 25 times your bet per payline. Sword Strike feature – a sword will hack away at the bottom row of the reels and remove a selection of symbols. New symbols drop down to replace them and a new payout calculation is made. You can get up to 3 symbol drops, with a new payout each time, with each trigger. Legion’s Glory feature – 1, 2 or 3 stacked wilds are added and a new payout consideration follows. Symbolus Maximus feature – look out her for the unfurling scroll which reveals a symbol. All examples of this symbol then turn wild. A second scroll unfurl follows, this time adding a multiplier to any win you may have achieved. Spears of Destiny feature – in this streak spin, the symbol from the triggering winning win is held. Respins then follows. These continue as long as a new matching symbol or wild hits. Bonus Boost feature – you’ll see more Bonus scatters spinning around the reels here to increase your opportunity of landing the feature round. Urn Riches feature – you’ll be taken to a new screen and offered a selection of urns. Behind each one is a multiplier. Keep picking until you find 3 that have the same amount. That multiplier is then applied to your total bet as a cash prize. You could get an upgrade to a potentially better bonus too or even direct entry into the Big Money Bonus feature. Uprising feature – the goal here is to destroy turrets. Each one that’s smashed delivers a prize. The more destruction, the better the prizes. Volcanic Cash Free Spins feature – in this free spins round, look out for the 2x and 5x multipliers which can hit on the middle reel and boost any payouts accordingly. The round continues until you see a Stop hit on reel 3. Any payouts on the final free spin benefit from a 6x or 10x multiplier. Empress’s Treasure Free Spins feature – land this round and you’ll receive 15 free spins. Joining the action here is the Empress Wild which can expand and fill whole reels. When 1 of these symbols hits, you’ll be offered the chance to lock it in place for the rest of the feature or alternatively choose a special cash prize. Big Money Bonus feature – you’ll be taken to a new screen and offered a selection of coins. Choose to reveal Big Money cash prizes. This round is triggered by landing 5 Bonus symbols in the base game or via 1 of the other features. If you’re disappointed with what the Bonus Wheel has delivered, you’ll be given the chance to gamble and hopefully land a better feature. If you lose the gamble, you’ll receive a consolation prize. Rome: Rise of an Empire ticks all the right boxes for a Blueprint Gaming video slot. The high spec design is nicely done and there’s a massive range of extras on offer. If you like plenty of variety then this should keep you going for a good while. 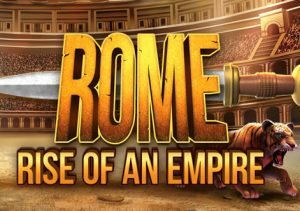 Rome: Rise of an Empire follows the usual Blueprint Gaming pattern of plenty of bonus features – they also offer you MegaWays video slots and highly volatile games with a single bonus feature with high win potential. I would recommend you try Vikings Unleashed MegaWays or the volatile Grizzly Gold – both offer you wins of up to 10,000 times your bet on each spin.